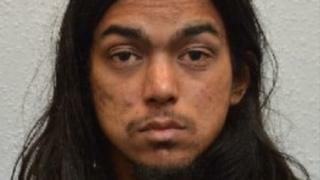 A man who plotted to kill the prime minister in a suicide attack has been sentenced to life in prison with a minimum term of 30 years. Naa'imur Zakariyah Rahman, 21, from north London, was convicted last month of preparing acts of terrorism. Sentencing him, Mr Justice Haddon-Cave said Rahman "would have carried out his attack" had he not been arrested. Rahman was captured by an undercover operation involving the Metropolitan Police, MI5 and FBI. He was arrested moments after collecting a bag and jacket from an undercover operative that he believed had been fitted with explosives. The judge said: "I am sure that at all material times Rahman believed the devices to be real and capable of causing serious harm." He added that the undercover officers involved in the case were "scrupulous" at all times and Rahman was the "instigator and author" of his own actions. Rahman made contact with IS recruiters via social media - but unbeknown to him the contact was actually an FBI agent. That agent referred Rahman to an MI5 team of online role players who convinced him that they were genuine IS figures. "I want to do a suicide bomb on Parliament," Rahman told the MI5 role players. "I want to attempt to kill Theresa May. All I need now is a sleeper cell to lay low for now." Rahman, Mr Justice Haddon-Cave said, had been "told and believed" that the rucksack bomb given to him was "capable of causing casualties on a scale comparable to those caused at the Manchester Arena", where 22 people were killed. Rahman's lawyer argued he had been brainwashed by his uncle - who was later killed in a drone strike while fighting for the Islamic State group in Syria - and said his client had not intended to go through with the plot. But a probation report read to the court by the judge revealed that Rahman had admitted in prison he would have carried out the attack had he been able to. A pre-sentence report described him as a "clever and cunning" young man who had the potential to "operate below the radar to dreadful effect". Mr Justice Haddon-Cave told Rahman he would have "plenty of time" to study the Koran in prison, adding that Islam was "a religion of peace". The judge added that Rahman - originally from Birmingham - was a "very dangerous individual" and it was hard to predict if he will ever be de-radicalised. During his Old Bailey trial, Rahman pleaded guilty to a separate charge of engaging in conduct which assisted the preparation of terrorist acts, which related to a "sponsorship" video he filmed for an associate who allegedly wanted to join IS in Libya. In addition to the life sentence, Rahman was handed six years in prison for the IS sponsorship video. The sentences will run concurrently, rather than consecutively.